But I digress. This is about B.B. King. Clapton – God himself – had invited some virtuosos to join him in a 12-hour benefit concert. It was a spectacular day – bright sun, blue sky, dry air, mid-70s – and the setlist read like an All-Star Game from the Sixties. This was the Mantle-Mays-Aaron-Robinson-Clemente-Koufax-Marichal of guitar. Alphabetically: Jeff Beck, Doyle Bramhall II, Clapton, Robert Cray, Sheryl Crow, Vince Gill, Buddy Guy, BB King, Alison Krauss, Sonny Landreth, Albert Lee, Los Lobos, John Mayer, John McLaughlin, Willie Nelson, Robert Randolph & The Family Band, Robbie Robertson, Hubert Sumlin, The Derek Trucks Band, Jimmie Vaughan, Johnny Winter, Steve Winwood. Sonny opened at noon, Buddy closed at midnight and they sandwiched 12 hours of unforgettable music. But the part I’ll never forget came in the afternoon, when B.B. King, a mere 81 at the time, was led to the stage. Before he could sit down, before he played so much as a single note, the 28,000 people in attendance (the concert reportedly sold out in less than 15 minutes) stood up and cheered. And they refused to stop. It was a tribute, and my eyes welled up. It was like watching Field of Dreams. And it wasn’t just the crowd. This is the part I’ll never forget: Every one of the artists who would perform that long day suddenly became part of the audience. Look to the side of the stage . . . There’s Clapton taking pictures. There’s Willie Nelson. There’s John Mayer. There’s Beck. There’s Winwood. There’s Sheryl. There’s all of them. They’re not sitting backstage. They’ve come out to pay tribute, too. And they stood there throughout the entire set. B.B. played solo. He played with Cray. With Hubert. With Johnny. With Derek. But nobody took his eyes off B.B. Attention must be paid. Do you remember back in 1999, when they played the All-Star Game at Fenway, and the greatest moment of the night took place before a single pitch was thrown, when all the players – the best of baseball’s best – mobbed Ted Williams, just to be near him, just to touch him? Flashback to the early Nineties, when for several summers my family would pack a lunch, lay out a blanket and take a seat on the grass at the Charles Ives Center at Western Connecticut State University, scene of the annual B.B. King Blues Festival. B.B. always brought along some stars, and he’d bring along some future stars. We saw Buddy Guy, the Neville Brothers, Robert Cray. And we saw a very young Jonny Lang and Susan Tedeschi. And, of course, we saw B.B. He was already old, already sitting in a chair. But he could still hit the right note at the right time in the right place and make your head spin and your whole body tingle. That was when Josh and Ben became fans of the blues. B.B. King could do that. I saw B.B. perform several times after that, because he just kept on going. Great artists, unlike great ballplayers, don’t have to retire. Sure, they lose some dexterity, but they accommodate. I saw Les Paul play when he was 93. I saw Segovia in his late 70s. I saw B.B. in his late 80s. How lucky am I? 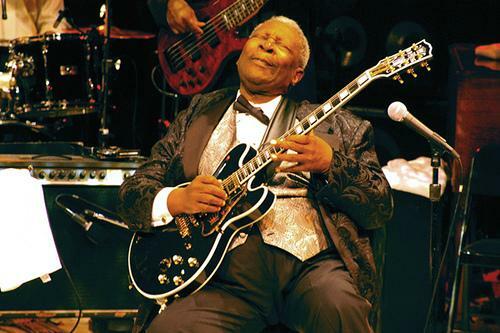 There may have been greater guitarists, but nobody – NOBODY – put his heart and soul into every note like B.B. King. Nobody – NOBODY – could bend a note like B.B. King. And nobody – NOBODY – could make you feel so good to have the blues. You’ll see a few hundred heds today that read “The Thrill Is Gone,” but that’s not mine. My iTunes library has 218 B.B. King songs in it, and there are countless thousands of others out there on the Internet. The thrill will never be gone. So I’m going with another hed. I like to think B.B. has moved on to another place and has reunited with Robert J. and Albert and Freddie and Muddy and all the rest, and that he’s back on his feet with Lucille in his hands, and that he’ll spend a few eternities playing with his friends. This entry was posted in In the News, Music, The Blues and tagged B.B. King, Blues, Eric Clapton, Guitar by stephenbromberg. Bookmark the permalink.